On October 13, 2011, UC-IMC co-founder Danielle Chynoweth was presented with the Woman of the Year Award at an event organized by the News-Gazette. To a packed room of more than 300 people, she gave the speech that appears below. Thank you. 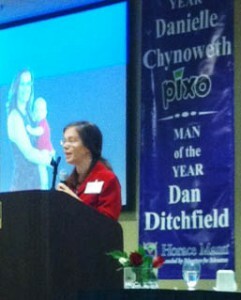 I feel honored to be named Woman of the Year in our community. When I came here after college, I fell in love with the trees that touch over the streets, the quiet busy-ness of our town where there is encouragement to think and create. This place opened itself as a playground for my imagination. In my first year here, I got the chance to conduct a lesbian feminist chorus singing Bulgarian tunes, produce radio theater on WEFT, and get my first job as a web designer by hauling a portfolio of paintings into the Beckman Institute. No matter what adventure I am on – building radio stations in Kenya, teaching media in Burma, reporting on freedom of expression issues in Thailand – I am always so happy to return here. I still don’t think any of us have been able to articulate the recipe for the special sauce of this town – and so, it remains our hidden secret. The News-Gazette asked me what I attribute my success to and, after some thought, I said the ability to see what isn’t there yet. By that I mean seeing the invisible as well as the possible. This is what is common to my work in media, art, and policy. To see what isn’t there – what doesn’t yet have an existence in the public consciousness – I/you/we have to go to where the silences are. One way I approach this is to cultivate a sense of myself as simply a person, who is no more or less than anyone else, who can talk to anyone about anything, and who commits to working with those affected by problems to solve them. So when my elderly co-worker told me she was facing homelessness because her trailer park was being demolished to make room for an apartment complex, I knocked on doors in her neighborhood and listened people to tell their story. We organized Friends of Lincoln Mobile Home Park, making the problem visible to the community as a whole, and successfully advocated for relocation assistance for hundreds of residents who were losing their homes. When I was invited to run for city council, as a young outsider up against the old guard, I knocked on 600 doors in my neighborhood, holding conversations about what we want for our city – some of the conversations running for hours into the evening. This was one of the most pleasurable times of my life, when I got to experience the intelligent curiosity of my neighbors. Out of this I saw a series of possibilities – a public arts program, public broadband, civilian oversight of the police, bike paths – all of which we did – as well as things we could still do – set a zero waste goal for the city, develop a grassroots, participatory budget process, help those marked with felony convictions grow their own micro-enterprises. I was one citizen going to where the silences are and advocating for new possibilities, but I wondered how to develop an infrastructure that would enable many people to do the same. So a group of twelve gathered in my living room 11 years ago to conceive of an independent media center that would provide the tools and training to surface many unheard voices in our community – to provide a forum to talk about problems and seek solutions together. A few years into our project, we looked at a nearly empty post office building in downtown Urbana and saw a community media and arts center. We wanted to use the power of creativity to bring white, black and brown together, and provide fertile soil for ordinary people to plant their audacious projects. Our decentralized structure and Do It Yourself ethos has allowed the IMC to grow to over 1200 volunteers – with a Books to Prisoner program that has shipped over 60,000 free books to inmates, a bike project that has recycled over 1500 bikes into the community, a performance venue and gallery, radio station, newspaper, artist in residence program, and non-profit incubation supporting 59 local and international projects. Out of one vision grew a structure to grow many visions. I want to live in a community that seeks to reveal, rather than hide, poverty and discrimination, to surface it, to see it, to bring everyone into the conversation, to talk about how it affects every one of us, to seek its roots, to try out solutions, to reflect together, to change our minds, to try again. I want a community that is honest about its history, able to truly see the situation of all of its residents in the present, and has the courage to take on seemingly unsolvable problems towards a shared future. Can we envision a Champaign-Urbana without a single homeless child? We have at least 163 homeless children amongst us – which would fill about half of this room. How many years shall we plan to overcome the deep inequalities by race? 2, 5, 10, 20? Can we set our sights on this and chart a course for how to get there? We do not have to accept unacceptable problems simply because we inherited them. Local communities, like ours, can be sandboxes where we can learn how to make democracy, where people participate in the decisions that affect their lives, with outcomes that are tangible and motivate them to continue to participate and grow as humans. I want to end with a poem I wrote about the ability to see what isn’t there yet and locate new possibilities that I wrote one month before I conceived my son, Ezra Shine Chynoweth, last year. Can a soul be made by wanting it?